Last summer, John Legg was one of several Middle Georgia State University students who took a "College on the Move" class to historic sites in the Carolinas. Over the course of the two-week trip, the students and their professor, Dr. Niels Eichhorn, visited some 30 sites, including Fort Pulaski, Fort Sumter, North Carolina Museum of History, Duke Homestead and Tobacco Museum and Kings Mountain National Military Park. The trip included a stay on the campus of North Carolina State University, where Legg and other students got to talk to faculty members about graduate school and career possibilities for History majors. Afterward, he turned his attention to the extracurricular project he planned to document his "College on the Move" experience: a 54-page photo book with images he took at each site, along with explanatory text that Eichhorn wrote. The result is the newly released "Images of the Historic Southeast: The Carolinas," which Legg, a freelance photographer, self-published. His fellow students and MGA History faculty are snapping up copies, which is for sale on Legg's photography website and soon to be available at select locations in Macon. "I approached Dr. Eichhorn before the trip and told him I'd love to do this," said Legg, 26, who will graduate with his Bachelor of Arts in History in December. "I thought it would be a good way to showcase the trip and get some more of my work out in the world. Dr. Eichhorn agreed to help me." Legg is a mostly self-taught photographer who got his start several years ago when a relative needed somebody to take publicity shots for his band. That eventually led to Legg’s freelance career specializing in photographing musical acts on stage and behind the scenes. He also travels around the Southeast and sometimes beyond shooting engagement photos, weddings, portraits for high school seniors and more. Eichhorn, assistant professor of History, developed the “College on the Move” initiative in 2015 to give students a living history tour of the antebellum South. Participating students earn credit for two courses by studying and discussing the historic sites visited and then producing research papers afterward. They stay at hotels and in residence halls on other campuses. In addition to tuition, each student pays travel costs of $1,200 to $1,500. "The overall goal is to make history a livable experience that goes beyond book learning,” Eichhorn said. Legg frequently combines his academic studies and campus life with his photography skills. Last year, using fellow student DeMarcus Beckham as a model, he shot a series of images that mirrored the vintage style of the Civil Rights era and served as a Black History Month tribute. More recently he was one of the photographers involved in a creative shoot of MGA student leaders. He knew the "College on the Move" class would provide unique photo possibilities, and he intended to make the most of it. 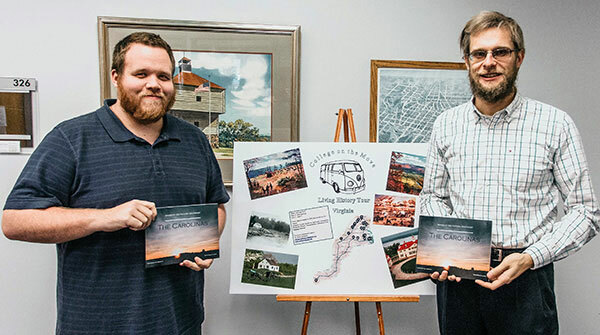 "I thought doing the photo book would look good as far as helping me get into graduate school," said Legg, who hopes to work for the National Park Service and eventually become a History professor. "The book was a cool way to document the experiences we had on the trip, and the support from my professors and others at Middle Georgia State turned the whole project into something so much bigger than what I originally imagined." Dr. Matt Jennings, another MGA History professor who has written or co-written Arcadia series pictorial histories of the Ocmulgee National Monument and Macon, invited Legg to join him at the Mulberry Street Arts and Crafts Festival on April 1 and 2 to sell copies of his book. The historic Cannonball House in downtown Macon has invited Legg to sell copies there on consignment. Later this spring he will discuss his book project at a forum hosted by Middle Georgia State's Knowledge at Work department. "I'm not sure I would get this kind of support at another institution," Legg said. "I'm very grateful." Anyone interested in purchasing Legg's book can go to www.johnleggphotography.com/store/. For information on the "College on the Move" class for summer 2017, which will explore historic sites in Virginia, email niels.eichhorn@mga.edu. You don't have to be a History major to take the course but you must be enrolled in Middle Georgia State University. Legg is planning to take this summer’s course, too, and create another photo book. MGA admissions info is at www.mga.edu/why/. Photo: John Legg, left, and Dr. Niels Eichhorn.